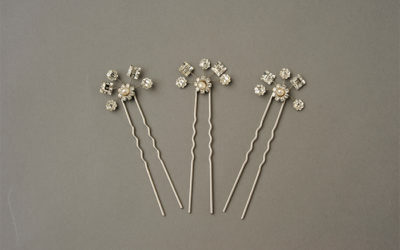 These hair pins are the accompanying pieces to Le Fleur Vine Comb. 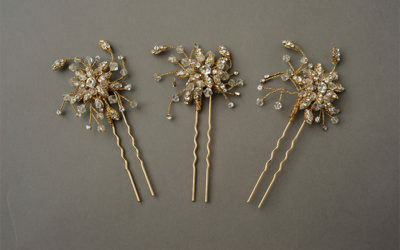 They are beautifully worn alone, if clustered together in a set of three. 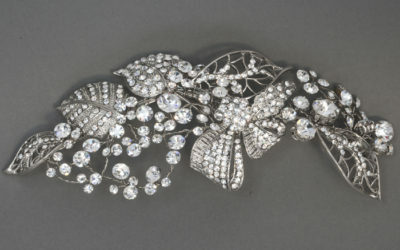 Available in Gold, as shown, or Vintage Silver. 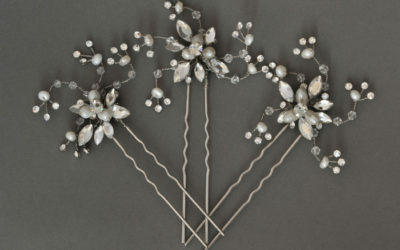 These dainty hairpins made of fresh water pearls and original Swarovski jewels are meant to be nestled in a chignon or French twist – for a hint of sparkle. 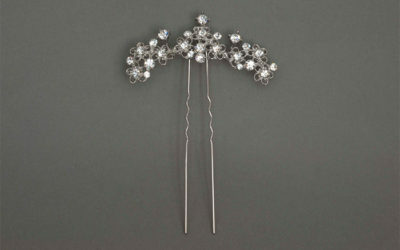 This lattice-work hairpin will compliment any romantic hairdo. 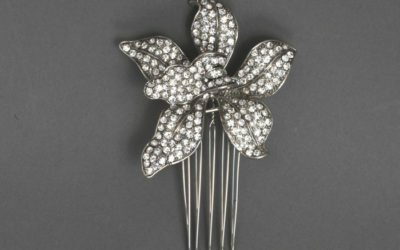 It can be centered in the back (like 'Sevillana' hairpin), or worn to the side of a chignon (like 'Carmen' hairpin). 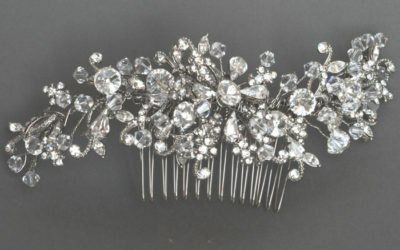 This jewel is best worn on its own. 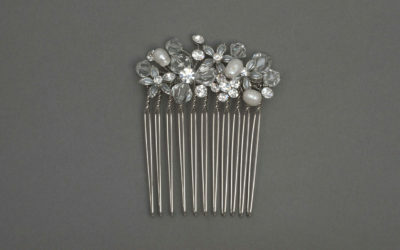 This bold statement comb features pave embellished floral accents with all clear crystal accents. 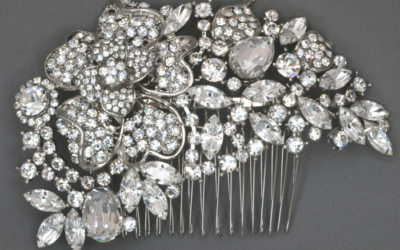 Reminiscent of the famous Cartier Orchid – a perfect accent for the bridal party, any special occasion or a lovely bride who wishing for the rest of her ensemble to take center stage. 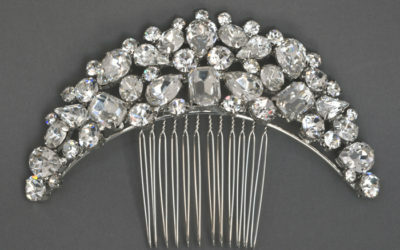 A crescent comb with clusters of large crystals of different shapes and sizes – Daring and bold. 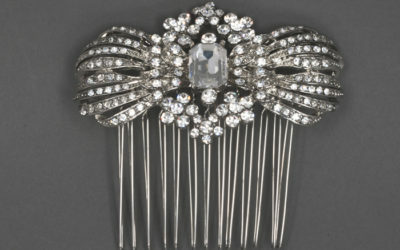 Parisian comb with elegant pave and Princess cut crystal in the center of its unique design. 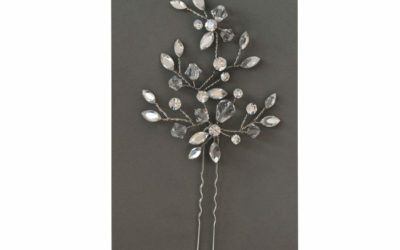 Lovely flexible accent full of leaves and crystal – on alligator clip.